At the Ibrahim Law Firm in Anaheim, California, we are dedicated to diligently representing our personal injury and bankruptcy clients not only in Anaheim, but also in Stanton, Cypress, La Habra, Garden Grove and throughout Orange County. We are known for going the extra mile for our clients, whether we are strenuously advocating for their right to compensation after an auto or other accident, guiding them through a Chapter 7 bankruptcy to relieve their crushing debt burden, or aggressively defending their personal rights and freedoms in a criminal prosecution. In addition, we handle immigration cases and workers' compensation claims. Attorney Ibrahim received his undergraduate degree from California State University, Fullerton, and his Juris Doctor from Western State University College of Law. He is licensed to practice in all California courts and is a member of the American Bar Association. In addition to English, he is also fluent in Spanish and Arabic. 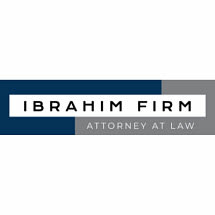 He and our entire team at the Ibrahim Law Firm are highly approachable, considerate and responsive to our clients' needs, questions and concerns. We offer initial free consultations so that our potential clients can get to know us and feel confident that when they hire us, they will be getting the best legal representation possible for their particular legal problem.